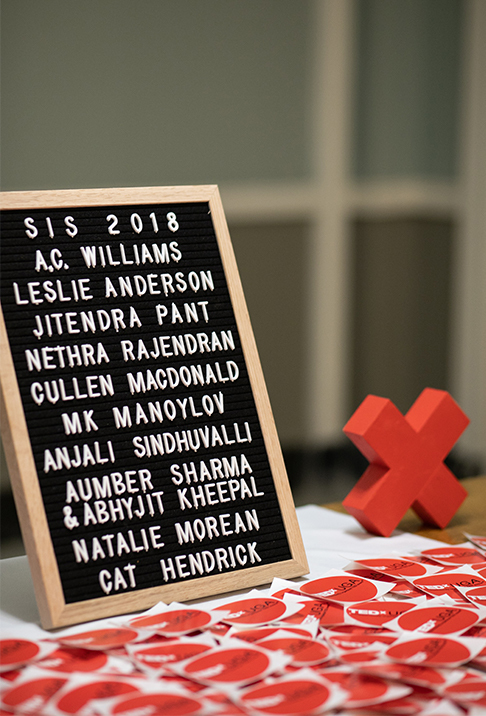 Earlier this month, the TEDxUGA Student Council hosted the 7th annual Student Idea Showcase. In this TED-like experience, 11 students took the stage at the Fine Arts Theatre to share their ideas worth spreading with nearly 500 members of the UGA student body. As always, the showcase featured ideas that ranged from complex to simple to sometimes shocking! The audience learned something new about a variety of topics including nitrous oxide therapies, elevators, video games, and even eating bugs. We are proud of all the student presenters and thrilled to see their ideas celebrated with the UGA community. But for three of the students, their time on stage doesn’t end there. Cat Hendrick, Jitendra Pant, and A.C. Williams have been selected to move on to represent UGA’s student population on the TEDxUGA stage in March. If you’re eager to see these students and the rest of TEDxUGA 2019: Amplify, make sure to save the date for Friday, March 22nd! And stay tuned – registration information and the full presenter line-up will be announced early next year. Want a peek at what you missed or a chance to relive the night? You can check out photos from the event on Facebook now. Don’t forget to find your snapshot from our photo booth!